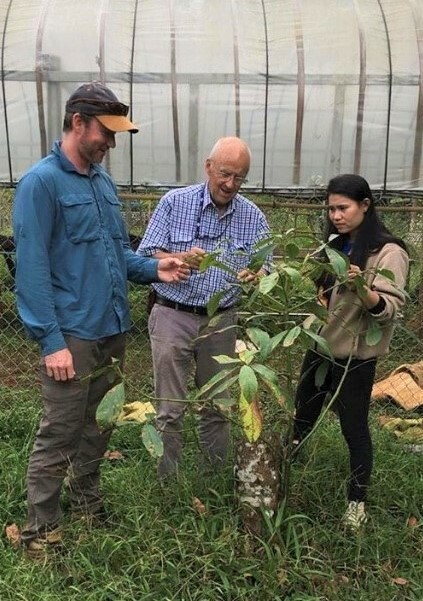 The Crawford Fund’s long term mentoring program in Laos uses a mix of Australian and in-country mentors and volunteers to improve biosecurity, trade, crop health, food safety and food security for farmers. We recently reported on a visit by mentor Dr Deirdre Lemerle, focused on improving weed management and we are also on the look-out for a volunteer soil agronomist. Just prior to Deirdre’s visit, Dr Len Tesoriero, a senior plant pathologist from DPI NSW, joined our lead mentor, Professor Lester Burgess, on a visit to the Provincial Agriculture and Forestry Office (PAFO) and the Crawford Fund sponsored laboratory at Pakse, Laos to assist in mentoring early career Laotian plant pathologists. In particular, Ms Sengphet Phantavong – no stranger to our project, and a mid-career Australian plant pathologist from NSW DPI, Dr Andrew Daly, who is our latest volunteer through the Australian Volunteers Program. Another specific aim of this visit was to assist in determining the cause of virus diseases in cucurbit vegetables, damping off of leafy brassica and leaf spot diseases of various vegetables and fruit trees. “Virus diseases are difficult to diagnose without access to nucleic acid sequencing – researchers are now able to bring back nucleic acid extracts to Australia for confirmatory testing. This process will be of great benefit to determine causal viruses and subsequently enable more informed management options to be implemented,” said Dr Tesoriero, in his report to us after the visit. He reported that carrying out crop surveys and laboratory activities were an important component to mentoring early and mid-career pathologists from Laos and Australia. “The visit assisted advances in accurate diagnosis both in Laos and internationally so that appropriate preventive management strategies can be devised,” said Prof Burgess, who will be returning to Laos in February for further work with Dr Daly, who’s volunteering work with our project has continued since Dr Tesoriero’s visit to Laos. Further investigation has followed by way of crop surveys in vegetable crops at the Sydney basin and reciprocal visits to the NSW DPI laboratories at the Elizabeth Macarthur Agricultural Institute (EMAI) and the University of Newcastle, Ourimbah, for discussion of diagnostic plant pathology.